Are you feeling happy right now? Are you the type of person who feels generally happy most of the time, do you feel quite happy or do you generally feel unhappy and struggling with yourself, your feelings and life in general? If you want better relationships, access to new opportunities and creative idea's, earn more money, and experience good health and well-being, then you will have a greater chance of accessing all of these if you feel happy and you practice chilling out and going with the flow. We all fall into the trap of thinking and relying on the needing of material things or things to go well before we allow ourselves to feel happy. Most people talk about happiness in a future tense, and they struggle with negative emotions in the present, this is going about things the wrong way around. We often convince ourselves that things will get better if we find a partner, have children, make more money, get a better job, buy a bigger house, buy a new car, when we retire and the list goes on, and of course you need to have your emotional needs and requirements met. But all material and physical possessions are illusions, and they will not guarantee you happiness, they will help, but what will make you feel better is restoring a state of inner calm, peace and happiness. "Make it your mantra that, today is going to get better and tomorrow will be even better". Because there is never a better time to make a decision to choose to be happy than there is right now, because if you're not going to start today, if you feel now is not the right time, then when is the right time? The first step is to end all your negative self statements and replace them with positive ones. All these negative self statements and the fear of failure will block off your path to happiness and prevent you from following your dreams and passions. Chasing happiness and putting yourself down all the time, in the end this becomes exhausting, frustrating and it eventually pulls you down and keeps you down, and after a while you come to realize that happiness needs to be cultivated from within instead of chasing it all the time. Some people think that happiness is a thing that they have to chase or search for, the truth is, you already have all that you need to feel happy. When you believe that happiness is something that you have to find, then you will continually search for it and never find it. This will keep you in the mindset of looking into the future, instead of putting a bit more time and effort into focusing on learning how to enjoy the present. You might have periods of happiness when things are going well for you, but life does not always run smoothly and after a while you will be searching for the next big thing to make you feel happy. It is far better to learn how to be more resilient and teach yourself how to react calmly and positive too difficult situations. A change in your perceptions means a change in your mood, and although it is good to have goals and wants, if you want to be happy then you need to nurture your now. Many of us spend a lot of time trying to please and make others happy, than we do, making ourselves feel happy and doing the thing that we enjoy. It's fine to compromise a bit for your family, friends and partners, and it can make you feel good when you help others and you make others happy. If your family, friends and partner are happy, then this is going to make your life a lot easier and smoother. But sometimes for the sake of your own happiness you have to think of yourself a bit and put yourself first now and again, so have a bit of me time as well to do the things that you enjoy. The happier you are, the more this will reflect in a positive way, to those who are close to you. Many of us, rely on others to make us feel happy, this is especially the case in some, relationship, where we can become totally reliant on the love and attention of our partners to make us happy. Our friends, family and partners have their own issues and challenges to deal with, so you cannot always rely on them giving you all the attention that you would like. It is important to try and help and support your partner, family and friend, but try not to depend on their attention or love all the time, to make you feel happy. Also, try to hate less and love more. We are all different, and not everybody shares the same views or opinions, we all like to live our life a different to others. If you spend all your time resenting people or hating, including your life and yourself, then this is going to make you feel bad. Another myth that needs, dismissing is, thinking that you have to do something or have something to feel happy. Some people think that they do not deserve to be happy or that they cannot feel happy all of the time or they cannot have all the things that they want. None of these are true, though, and although you cannot be at the top of your happiness levels all of the time, you can teach yourself how to feel good most of the time. A good place to start is, to try and make your bad days better and try and make your good days better. Thinking that you do not deserve happiness can lead you into thinking that you have to earn it and work for it. Yes, bad things do happen, and we all have problems and bad times that we have to deal with, the thing is, to try and bounce back or stay strong and positive, even through the tough times. One of the biggest secrets behind being happy in life is to stop resisting life and your feelings, desires and emotions and to begin to let go of all the negative and bad stuff and practice the art of allowing and letting life happen. The art of allowing is the missing piece of the jigsaw of the Law of Attraction and it is the difference between living a happy and successful life and a life of struggle, frustration and emotional suffering. We all have our dreams and desires, but on the flip side, we all have our own difficulties and problems, where we get sucked into living our life in the emotions of our concerns and issues, instead of learning how to let go so we can clear the way for better things to come. It has become a part of human nature to try and fight, control and resist everything and push away the very things that they want. Have you ever really wanted something so bad, that you try to force it or make it happen, and the harder and harder you try, the more it seems to elude you, including your own levels of personal happiness. When we allow life to happen and we get out of the way, life becomes so much easier and our problems seem to fade away or the solutions come to us. Do you focus on what you want all the time and take action steps towards your goals and wants, or do you focus all your energy on the not having or the not happening. To feel happy and to have a great life, you have to go with the flow instead of fighting against it. When you go with the flow and you just allow life to happen naturally, instead of resisting the things that you don't want, then you will start to draw your deepest desires towards you and if you take action then you will achieve your goals easier and quicker. Although positive, constructive and creative thinking can open up new doors, ideas and opportunities, and good thinking skills can be life changing. But before you can learn new thinking skills, it is highly important that you know how to manage your anxious and unwanted thoughts that will drag you down and drain your happiness and confidence levels. So many disrupt their energy in their body and they transform that negativity and disruption of their natural free flowing energy into their thinking. When you bring your attention and awareness back into your present, you will return back to the free flowing and peaceful energy. Positive forward thinking, planning and intentions, will help to guide you to a happy life, but for the most of the time, your focus of attention, should be aimed at enjoying and engaging in the here and now. Some people tend to over think and over analyze everything, and instead of focusing on what they want or just letting go of trying to control everything, they get drawn into thinking about, why things are going wrong or why they aren't getting the things that they want. The art of allowing will require you to give up the struggle and fight with your feelings and life, this means letting go of all of the bad and negative stuff and beginning to replace it with all the good. This can be hard at first for many people because they have spent so long focusing on the worse case scenario and planning to try and avoid all the negative stuff from happening. People think that success is all about hard work, and although some goals can take time, a lot of action work and effort, hard work alone is not always the answer. Because you can only do so much physical work, and unless your action work is backed by emotional balance and a positive mental attitude and mindset, it will always be an uphill struggle. When people start working on a goal, they decide there is something that they want in life, or they're trying to change their life for the better, they will often work hard and put in long hours, in a desperate attempt to achieve their goals faster. They start off all excited and enthusiastic, but then when it does not happen immediately, then their old friend self sabotage and self doubt will start to creep in. When people don't get the instant results that they want, they become frustrated and then they think the answer is to try harder and harder. Many people preach the fact that you have to work hard to achieve your goal, others believe that you need material things and possession to feel happy. The art of allowing suggests that we do the opposite to what we have been told or the only option that we think that we have, where we surrender to, all our struggles and end all our inner resistance, so instead of struggling and resisting we return to our natural state of happiness, creativity and flow. What makes us unhappy, is when we give all our attention to what is or what is not happening in our life at the moment, then we continue to allow what is, to influence our feelings and dictate our actions. Bad things happen and we all have to face our own personal problems, challenges and problems, but the longer you react badly or negatively to your difficult and unproductive times the longer you will hold on, to your bad feelings and emotions. Instead, we should, let the negative or the unwanted go, chill out a bit, ride the wave and storm, whilst still remaining upbeat, focused and optimistic. Getting out of the way and just allowing life to flow and happen, may go against your way of doing things, but it is essential to be happy in life. Many people think that they have to fight and work things out for themselves, but, the how part, is the job of the universe, and your job is to go with the flow and take the action steps that you need to follow when they arise. If you were stuck on a river in a rowing boat, and you wanted to get to the river bank, and let's say there are only two places where you can get off the river. The closest point, is upstream, but you will have to row and battle against a strong current to get there, and the second point is further downstream, but it will take less effort to get there. If you go against the strong current, you will be going against the flow, this will be a big struggle and battle, which will leave you soon feeling exhausted and drained of energy, and you will make little progress. If you take the second option, and you go downstream, you will stop resisting the current and you just go with the flow, so you will save all your energy and you will get to where you want to be easier and quicker, without all the struggle and hardship. This does not mean that, living a happy life and achieving all your dreams can be achieved by just feeling good, because you will also need to take inspired action at times, but the sensible approach would be the one that requires the least amount of effort and struggle. Happiness is not all in the mind or having all the material possessions, if you want sustained levels of underlying happiness, then it is important to listen to and look after your body. When we talk about being happy, it is more about feeling good and having inner peace and balance, because nobody can feel the over the top kind of happiness all of the time. The body needs plenty of rest, enough good quality sleep, and it needs to the right amount of nutrients and activity. When all these requirements are met, then you will feel happier, more at ease, more balanced and your mind and body will function at their peak performance best. What your body does not need a lot of, is, too much stress and negativity, a poor and low in nutritious foods and a lack of physical activity. Poor posture, or sitting and standing in, tense, stiff or collapsed postures, will also have a negative effect on your happiness and confidence levels. The anti-dote to stress and a happier life, is to learn how to relax and return your body back to its natural and balanced state. When your body is calm and balanced and fed with all the right nutrients that it requires, then you won't have to try and chase happiness because it will start to come naturally to you. And when, you have an underlying state of inner peace and balance, and your body is functioning and ticking over efficiently, then you can focus on living the life that you want and deserve. By changing your diet and reducing or even eliminating any foods that might cause inflammation and foods you may be sensitive or intolerant to, sugar, grains, and processed foods. Both your physical and mental health can change and improve for the better, and good mental, emotional and physical health is an absolute necessity for your own happiness levels and to go on to live a happier, more successful and more rewarding life, it is important to address these issues first. So many people find relief from stress, negativity and depression by changing their diet and adding meditation or biofeedback. What this means, there are natural ways to help you reduce your stress and bring about balance and harmony to your mind and body, by learning to restore inner flow and balance. You can naturally achieve this, by learning to how control your own body and mind, such as your muscle tension, your breathing and your heart rate as well as reducing your stress, because when your body is happy you will be happier. 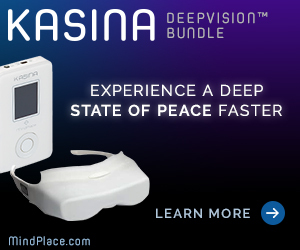 MindPlace's newest and most mature light and sound machine, the Kasina, offers some amazing benefits, including helping fight stress and reduce your anxiety levels, give you more energy and help to lift your mood.